Gratitude Statement: Please read Book One of the Meditations of Roman Emperor and Stoic philosopher Marcus Aurelius. Then write a concise statement of gratitude (400 words or less) identifying the ethical and intellectual debts you owe to family members, teachers, friends, and the broader society as a whole. Fictitious names are permitted, but the statement of gratitude should be genuine. Exercise from the Academic Integrity Seminar, Integrity Seminars, www.integrityseminar.org. Students express thanks for important influences in their lives and, within the context of the Seminar, many students notice how those influential individuals tend to have high trust and integrity. This exercise produces some of the best student responses in our seminar. So much our modern quality of life results from economic specialization. I do Activity X, my neighbor does Activity Y, and we’re both better off because we trade with each other. We get to specialize in our respective activities while sharing in the fruits of both. Economic specialization is the idea that we can each focus on what we’re good at, and then trade to share our production. I don’t have to learn how to hunt, grow crops, build houses, make clothing, or a variety of other activities that we need for day-to-day survival. Instead, I sit at my computer and write economic reports, and then trade for what I need. Comparative advantage. We get to take advantage of different people being good at different things. I might be a good builder, whereas you might be a good farmer, and so we produce more together by focusing on our highest ability activities (hat tip: David Ricardo). Economies of scale. We also reap the benefits of economies of scale. Because workers and companies can focus on single tasks instead of having to do everything personally, we can massively scale production and serve the entire world population with costs that decrease with size. Skill improvement. 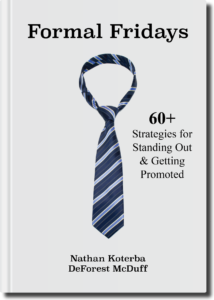 By focusing on our narrow niches, we get better at those niches. The more nails you hammer, the better you get at nailing them — so the overall quality of goods and services in the economy improves. I’d rather hire a plumber that plumbs all day instead of one who plumbs as a hobby. We have billions of specialized individuals on the planet, all working in unique niches that fit together for enormous total output. The economic pie is huge because we specialize and trade. It’s incredible, really. 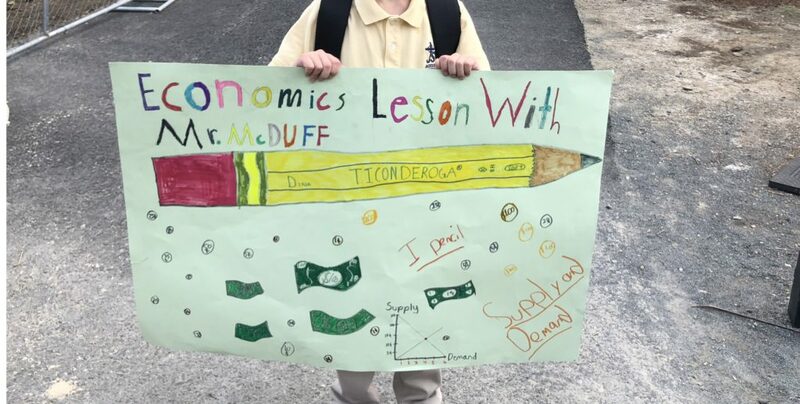 A classic example of economic specialization is “I, Pencil,” based on a 1958 essay written by Leonard Reed about the complex cooperation and coordination that occurs every day in making pencils. It takes millions of people across the world to make a pencil, with no single person knowing how to do it or single entity being responsible for coordinating every step. A true demonstration of Invisible Hand. Have faith that free men and women will respond to the Invisible Hand. This faith will be confirmed. I, Pencil, seemingly simple though I am, offer the miracle of my creation as testimony that this is a practical faith, as practical as the sun, the rain, a cedar tree, the good earth. Leonard Reed, “I, Pencil: My Family Tree as told to Leonard E. Read,” 1958, available at EconLib.org. Just last week, I taught another guest lesson for my younger son’s first grade class. 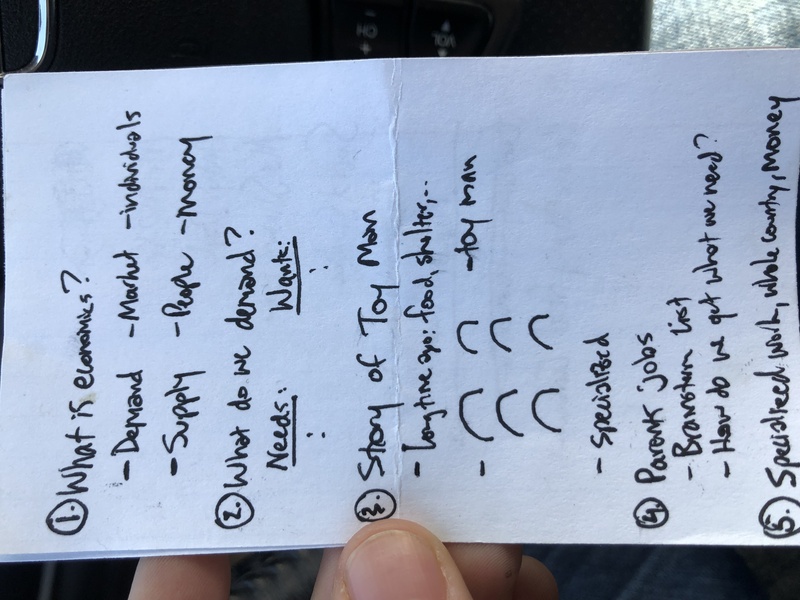 I told them the tale of the Toy Man, which is a story from Schoolhouse Rock or other cartoon that I remember from growing up but can’t seem to find on the Internet anywhere. It is a tale about an early caveman economy where each Dad (and Mom!) used to do everything personally: hunt, fish, build shelter. Until one Dad specializes in making Toys for the village kids and trades with the other Dads for everything his family needs. Here’s a link to my complex lesson plan. 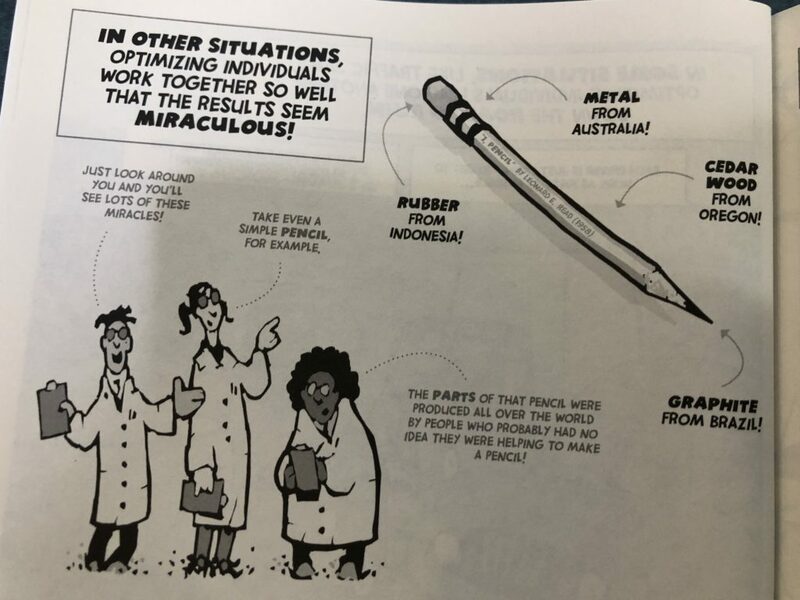 Over the winter holidays, I was delighted to see “I, Pencil” appear in Yoram Bauman’s Cartoon Introduction to Economics, which was a stocking stuffer from Santa for my kids (how awesome that Santa likes economics too!). Yoram Bauman, The Cartoon Introduction to Economics, Volume One: Microeconomics, 2010. So many stories in economics can be boiled down to the benefits of trade, specialization, and how the market facilitates the coordination of those benefits across millions of people. Amazing! Making a guitar. Similar to making a pencil, but even more steps and more complicated! Downloading Adam Sandler lyrics. It’s so easy to log online and pull the lyrics from any song, which I did for Adam Sandler’s Hanukkah Song. Brainstorming lyrics on my iPhone / iPad. I synced up my iPhone and iPad note app so that I could jot down rhyme ideas anytime and anywhere. Have an idea while bathing the kids? No problem — I just it down on my phone and it exists next time I pick back up work. My devices are, of course, synced together over a data warehouse and wireless connection (each of which is individually incredible). Recording the song. I recorded the song on my iPhone (1st take! ), which is an amazing feat of technological progress. Imagine going through the “I, Pencil” exercise for an iPhone. Finding pictures online. I spent a few hours gathering economist pictures online. 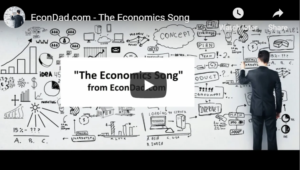 Nearly every academic economist or book author has their own website. At no other time in human history could we gather these pictures so easily, not even 10-20 years ago. Organizing a script in Google Docs. I organized a Google Doc (connected to the Cloud), to outline the script and instructions for making the video. Hiring several video illustrators using Fiverr. I interviewed and hired several video illustrators over Fiverr, an online community of designers and free-lancers, to produce the video all together for less than $50. Converting the video to YouTube. I logged onto YouTube to convert the video to the proper format and upload to the world. The conversion process is all so seamless, but just think of the calculations and processing that occur behind the scenes. Publishing the video online using GoDaddy and WordPress. I published the video to a blog post, which is hosted by GoDaddy and managed by WordPress, both of which have thousands of workers and serve a multinational customer base. Posting the material on Facebook and elsewhere. Finally, I posted the material on Facebook and a few other places and — voilà! — it’s shared with the world. It’s mind-boggling to think of how many moving parts there were to make this simple video. Wow! Just wow. Perhaps the most important example in today’s economy is specialization in creating and sharing ideas. We have so many technologies and platforms that reduce the cost of sharing ideas, so that each of us can specialize in creating them. “More data will be created in 2017 than the previous 5,000 years of humanity.” App Developer Magazine, 12/23/2016. “Within five years there will be over 50 billion smart connected devices in the world, all developed to collect, analyze and share data.” Forbes, “Big Data: 20 Mind-Boggling Facts Everyone Must Read,” 9/30/2015. “[Writing] meant that information can be passed on, from generation to generation, other than genetically, through DNA. There has been no detectable change in human DNA, brought about by biological evolution, in the ten thousand years of recorded history. But the amount of knowledge handed on from generation to generation has grown enormously.” Stephen Hawking, Quartz, “Stephen Hawking’s moving argument that human evolution has gone far beyond biology,” 3/14/2018. Stage 1: Word-of-mouth. Humans share stories, ideas, and survival tactics within groups and across generations — from the creative power of an individual mind to the creative power of a group. Stage 2: Writing. Humans figure out how to record ideas through the written word, and share them across time, geography, and cultures — from the creative power of a small group to a large group. Stage 3: Printing Press. Humans figure out how to mass produce writing, so that a single idea can quickly traverse the entire world population — from the creative power of a large group to essentially the entire world. Stage 4: The Internet. At present day, all of the world’s information is at our fingertips, accessible by any human at any time — from the speed of physical distribution to the speed of simply creating and recording ideas. Stage 5 (? ): Instantaneous Collective Thought. Will the next stage involve sharing ideas via brains plugged into the Internet and/or a single, collective human intelligence? See what Elon Musk is doing with Neuralink. Wow, that was a bit of a rabbit hole, wasn’t it? Bottom line: Because of the incredible development of platforms and mediums for sharing, we have freed up millions (eventually billions) of humans to specialize in creating new ideas. But that’s how things have worked out for many Dads in the knowledge economy. We don’t need to literally Hunt the Elk to feed our families. Instead, we think, share, and trade. So, this year, and every year, I’m grateful for economic specialization and the fruits of economic opportunity that it has created. It’s an amazing wonder of the modern world, and is essential to today’s pursuit of a meaningful life. Readers: Are you a highly specialized creature? In what way? 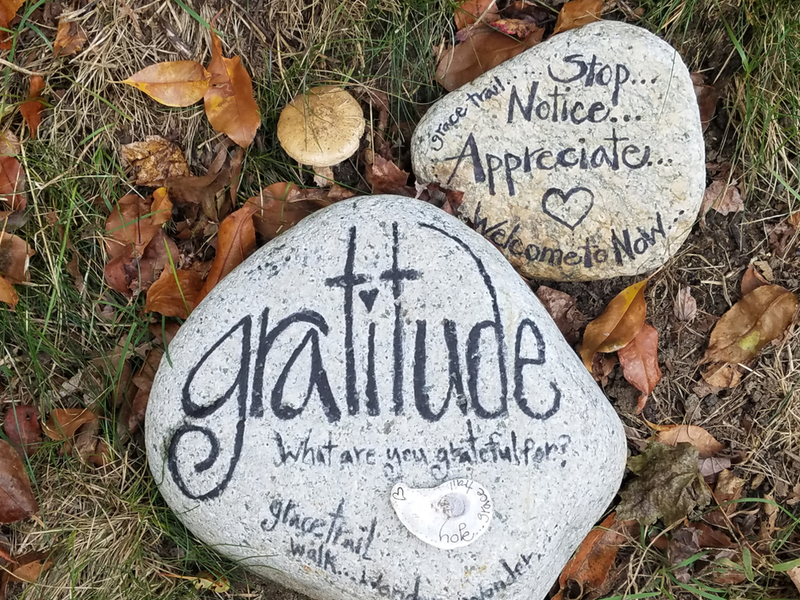 What else are you grateful for in our world today?